Merry Christmas to all my friends celebrating this special holiday! We don't celebrate Christmas but B and I will be enjoying our own Christmas cheer this weekend at my sister's birthday hi-tea. Tonight however, we'll be watching the LIVE finale of Idola Kecil 3, which I'm looking forward to. The concert will air at 8.30pm on TV9 by the way. 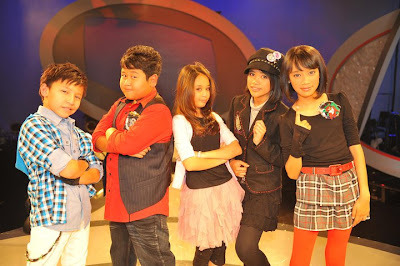 Idola Kecil (Little Idol) is the #1 Kids reality TV program in Malaysia and Season 3 is the first one I'm following. Apparently this season is the best so my timing was perfect to start watching this year. I caught the recording of the very first concert, which opened with 1o students in the age range of 9-12 years. As the host of Idola Kecil, Alif (One in a Million) does a great job of drawing in the crowd without having to scream out everything he says, which seems to be a trend among some of our older, supposedly more popular hosts. I hope Alif returns as host next year. I was rooting for Deera (photo above) to make it to the Top 5 but she has already been eliminated. Hadi on the other hand has made it to the final and he seems to be the crowd's favourite right from the start. It's totally understandable too for Hadi is the most adorable boy contestant with an extremely likeable personality and an equally charming voice. Now this is who I'll be cheering for tonight - Harris! He is totally amazing and he has the whole package to make it big in our local music industry. Born to sing, Harris is a great performer and he sticks to his calling as our next big rock star! He looks the part, sings the part and he always captivates the audience from beginning to end. It will be a huge surprise and upset if Harris does not emerge tops this season! In the photo above, you can see Puteri and I think she is Harris' strongest contender. At the tender age of 12, she has already demonstrated her power and presence with a bigger impact than some of our popular singers today. And though her female counterparts Balqis and Shazlin are equally wonderful, Puteri is in a whole different league! So who will win? Who will be crowned as Idola Kecil Season 3? Tune in to TV9 tonight at 8.30pm to watch the live concert of Idola Kecil and who knows you might even catch a glimpse of me somewhere in the crowd! This is a show I haven't heard of, but I love the last pic because I think they all look adorable! wah all this org kecil so pandai bergaya edi.. heheh..
haha so so true on the screaming and shouting by the older host.. they have to learn from Alif lah...heheh..
oh tonight eh? remind me? lol! Have a Merry Christmas and a good rest! have a wonderful time M!!!! He oozes with confidence and he is really dazzling! I hope you are also enjoying the holidays just like us who are celebrating it. High Tea sounds very lovely!! We are still in Corpus for today!! Okie Dokie...need to get some drops done!! Hi hi hi Mariuca!!! :* :* :* How's it going? hope all is well for you. it has been a super busy, very good and very productive week for me. Seems like my weeks will be this way for a while and my hubby told me i need to slow down. just came back from work and this is my first blog hop for today. have to stop by to say hi despite my busy schedule. thanks for all your X'mas and NY wishes, i enjoy reading them. hope you've a good one too. that looks like a fabulous show and the kids look adorable. gotta go now dearie. Happy New Year to you and B. hope you had a blast tonight. woohoo! Hello hello Mar'! How's it going? :-D Happy new year to you and B! Hugs! :* :* :* David FC! :-D :-D :-D :-D Maxi!